They're a staple of children's bedrooms, school dorms and overnight summer camps, but those double-decker bunk beds beloved by kids of all ages are responsible for a number of serious injuries each year and even some deaths. "Everybody has probably slept in one at some point or another in their lives," says Lara McKenzie of the U.S. Nationwide Children's Hospital, principal author of a study on injuries related to the bi-level beds, published recently in the journal Pediatrics. "Everyone wants to feel safe and secure while resting or sleeping, yet bunk beds are really a common source of injury among children and adolescents." Between 1990 and 2005, her study found that 572,580 children and youth were seen at U.S. hospital emergency rooms for bunk-bed-related injuries alone, an average of 36,000 a year. Almost 94 per cent of those injuries occurred in the home and 72 per cent were caused by falls. Other injuries arose from striking or hitting the bed, jumping from the bed, ladder-related incidents, bed malfunction and entrapment. The Canadian Hospitals Injury Reporting and Prevention Program (CHIRPP) complied figures from 15 hospitals across the country. They show that about 1,500 children were hurt in bunk-bed accidents between 2002 and 2006. Pamela Fuselli, executive director of Safe Kids Canada, said children under age six should never sleep on an upper bunk but be kept on the lower bed, "because what we see as the main causes of injury are falls from the top bunk and falls off the ladder." McKenzie's data shows lacerations are the most common type of injury, especially among kids under 10, followed by bruises and scrapes, fractures, concussions and strains or sprains. The most common site of injury with children under age six is the head, neck and face. They are more likely to suffer trauma there than older youngsters because their higher centre of gravity tends to make them fall head-first. Almost 40 per cent of head and neck injuries involved concussions, the study showed. Most fractures (almost 68 per cent) occurred in the upper body, with children aged six to 13 at increased risk for broken arms and other upper-extremity bone breaks than older children. What came as a surprise to the researchers was the proportion of bunk-bed injuries in older adolescents and young adults. "The thing I found really interesting in our study is we had that spike in the 18 to 21 age group," said McKenzie, with that age range experiencing twice as many injuries as teens 14 to 17. "We don't really know why the college-age individuals 18 to 21 years old experience more than double the number of injuries ... 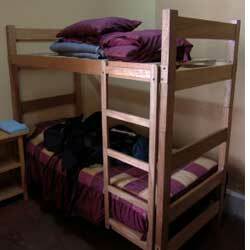 The older age group probably sleep in bunk beds more often, in their college dorms or in the military, for example."